Start your review of Peter van Dorsser. Send a message to Peter van Dorsser. Thank You! Your message has been sent to Peter van Dorsser at Whitby Oshawa Honda. 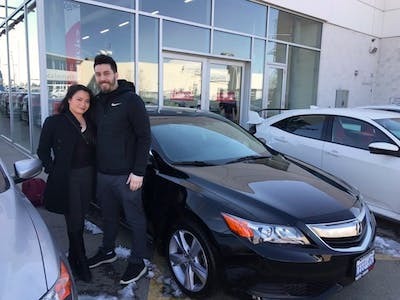 "My best purchase experence of the last 8 used cars purchased"
Mike provides the over-the-top service that I have come to expect from this Honda dealership. Very knowledgeable in all aspects of the transaction. Questions were all answered, without hesitation. Very genuine personal service, I like that. Moving on to the finance guy, Peter, also very well trained, he knows his stuff, answered every question I had, was clear and concise. I would not hesitate to recommend either Mike or Peter to any of my friends, colleagues or co-workers. good work guys. I love this dealership and my most recent interaction with Peter has been fantastic!! I had a problem with my windshield and he provided me with ALL the options and information I needed to make an informed decision on what to do next. You’ll keep getting my business! Anna Sautner was my sales rep and she was amazing! She wasn’t pushy at all which I really appreciate in a car sales person. Buying a car is stressful enough let alone having 5 salesmen emailing and calling you 10 times a day. She even came in on her day off to let me take the car for a test drive! When I had a question that she didn’t know the answer too, instead of talking nonsense (like most car salesmen do) she said she was entirely sure and got en expert to explain it to me. I love me new Honda and I would highly recommend seeing Anna for buying a vehicle!